Consultants from across the business have taken the first steps this week to achieving their Apprenticeship in Recruitment Practice and their REC Qualification. 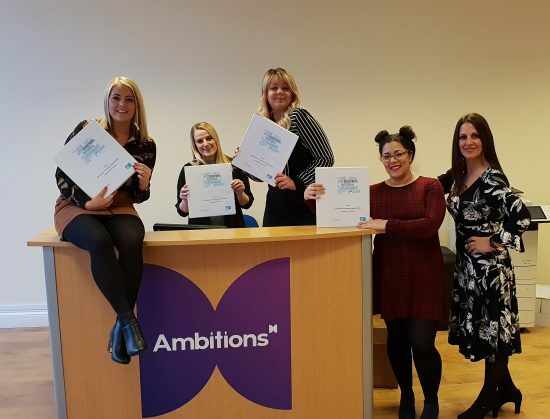 Michelle Dalby (Newark), Lynsey Shortland (Derby), Kelly Grey (Mansfield), Cheila Loucao (Grantham) and Shereen Benjamin (Nottingham) are all embarking on the course, which is being delivered by Impact Futures. We wish them all the best of luck with completing the course, and hope the new knowledge gained leads to even more success in their roles in the future. We’ll let you know how they get on! Pictured (L-R) Michelle Dalby, Lynsey Shortland, Kelly Grey, Cheila Loucao and training manager Rachel Graham.